UPDATE 18.03.2017: I've shared things for 3 months. Due to personal reasons sharing is over. Tnx for cooperation. Don't ask for files, because there is no repository. Does anybody have a copy of FS-UAE v2017 set including the last update that they can upload? dax wrote: UPDATE 18.03.2017: I've shared things for 3 months. Due to personal reasons sharing is over. Tnx for cooperation. Don't ask for files, because there is no repository. Thanks for all your time and money you put into the uploads. It's only a small piece, comparing to Your work, .mad. Don't blame you Dax, you have done more than your bit and have helped an enormous amount of people but in the end it becomes a chore, its like when I collected games / copies of games back in the early Atari 8bit computer and C64 days. I'd go and physically get a new batch of games and then the calls started, "can you bring them down to Software Exchange on Saturday for a mega swap". Helping people is a lovely thing but when it turns to a headache it time to stop..
Now, I get to play rather than swap, I get to work on projects I like and stop when I need to.. The last bit IS a joke He's also a great bloke and has done so much for everyone..
MAME Mini Christmas Edition released. Do you remember Contra, Galaga, Super Mario, Street Fighter, Crash Bandicoot, Cadillacs and Dinosaurs, Metal Slug or Tekken 3? And maybe other titles from the 80's or 90's? If you want to play it again you do not have to buy a heavy (about 100kg) arcade machine, have several consoles or even a PC. You may use a Raspberry Pi 3 - a computer with the size of a credit card. 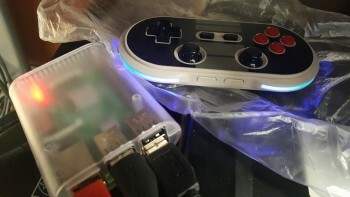 When you attach a joypad, microSD card and HDMI cable, you will get a fully functional arcade/console system, which may be connected to your TV. 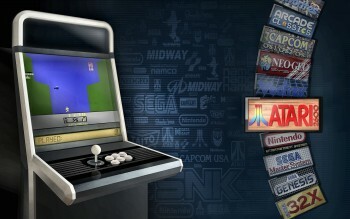 Arcade Classics - games from my earlier MAME Mini compilation. Only those games that work properly under Raspberry Pi 3 and can be controlled comfortably (390 games). CPS - Capcom Play System 1, 2, 3 games. All attached, except quizes and games requiring Japanese language (75 games). Neo-Geo - Neo-Geo games (145 games). To do this I've used Attract Mode engine, the most flexible frontend for RetroPie (IMHO). There is a short video for each game. Compilation is password protected, which is necessary to unpack. In addition, it should be activated after 3 months - it is "anti-piracy" protection. Otherwise, the system will stop working. The reason is simple - too many people sell different compilations, not being their authors. I give you this for free and I do not want that someone make money with this . Keyboard and X1/X360 pads mapped. Others joypads may work, but not as good as expected. I've disabled any possibilities of modifications to protect my work from "pirates". Like it or hate it. If this compilation helps you get back to the old times, when You was a kid and played these games, You can send me a postcard of your city - as a gratitude. Last edited by dax on Sun Apr 30, 2017 9:00 am, edited 1 time in total. Compilation is password protected, which is necessary to unpack. In addition, it should be activated after 3 months. You can send me a postcard of your city - as a gratitude. Do i need to install and then activate it (from the RetroPie) in the 'next' 3 months. or can it be actiavted 3 months 'after' the install. i will send you a few photos. No need to install. Just write image to microSD card, put it in Raspberry and power on. As about protection - "after" and I don't want to explain more about it in public. I hope You will understand . If You interrested, I can send You a password. MAME & HBMAME Mini v185 released. Added some rom fixes and a few of new games. Dax, could I request the password for the RetroPie image? Included support for X1/X360/8bitdo pads. Customised mappings for Retroarch, Attract Mode and all Libretro emulators for these pads. Other updates. Added: Atari 2600, Sega Master System with games, wheels, movies, configs (if necessary). Updated: mappings for keys, X1/X360, 8bitdo pads, XIN-MO arcade controllers. There are more systems like: SNES, TG16, PSX... Unavailable on the screen. Including "2 players simultaneous mode"